There's no doubting that 1349 are one of the more interesting Norwegian black metal bands of late, releasing albums that may not always be excellent (Revelations of the Black Flame) but always being unusual enough to bear attention – in addition to the band boasting Frost on drums. Yet this, their sixth album, comes as a reminder that they weren't always as worthy of attention, stripping much of the atmospheric touch that made Demonoir such a good album away and seeming rather average in result. 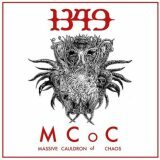 There's a thrashy vibe to the riffs, and a technically-sound performance from all involved, but where Demonoir was the sound of a band that had found its voice, frustratingly Massive Cauldron of Chaos suggests that 1349 have lost it again. The tendency for songs here to sound either derivative or just plain dull doesn't help; first single Slaves is a case in point, coming over as a thrashier Marduk in style but with little of the intensity or viciousness that has defined the Swedes in recent years. Exorcism feels like the band on autopilot, with some pleasingly melodic guitar leads far too restricted, the groovy opening to Postmortem is a deceptively refreshing intro to a dull song, and although Mengele's choppy riffing is sharp, it still sounds like the band are playing it safe. The one standout track is the shortest, Golem's sub-two minute blasting assault sounding like the band actually expressing their anger well. It's not at all punky, as some reviews seem to be describing it, but it does show that when they want to, 1349 are still capable of writing killer rather than filler. It's a disappointment, not least because at moments hints of genius almost burst through – the band just drown them in a torrent of black metal riffage that sounds identical to everything around it. The production is stellar, clear and cold, the performances excellent – the songwriting, however, lets the band down. 1349 are better than this, which is treading water at best.